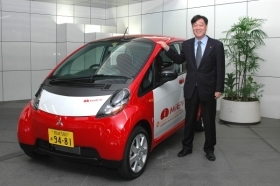 Mitsubishi CEO Osamu Masuko with the i MiEV. TOKYO -- Mitsubishi Motors Corp. has priced its new electric vehicle at ¥4.38 million, or $45,660 at current exchange rates, and wants EVs to account for 20 percent of its global output by 2020. Mitsubishi unveiled the production version of its i MiEV battery-powered car on Thursday, saying it aims for 1,400 lease sales to corporate customers and local governments by March 31, 2010. The i MiEV goes on sale in Japan late next month. Separately, Fuji Heavy Industries Ltd. unveiled an electric version of the Subaru Stella small car, also priced above $40,000. But Mitsubishi's sales goals are more ambitious than those for the Stella and include some overseas sales. The Subaru Stella won't be sold outside Japan. Europe gets a version of the i MiEV next year. The U.S. launch of the lithium ion battery-powered car comes after that. Those prices haven't been announced. Individual sales in Japan start in April 2010. Mitsubishi will begin taking those orders in July. Buyers can qualify for a $14,490 green-car subsidy from the government, bringing the cost down to $31,170. The four-seat, bubble-shaped i MiEV is the centerpiece of Mitsubishi's plan to leapfrog bigger rivals such as Toyota Motor Corp. and Honda Motor Co. in environmentally friendly technology. Mitsubishi missed the hybrid-vehicle boom and wants to move straight into zero-emissions EVs. The small commuter car has a single-charge range of 99 miles, which Mitsubishi says is good enough for 90 percent of the average Japanese daily driving needs. It can recharge its battery in 14 hours on 100-volt power, in seven hours on 200 volts and in 30 minutes on a high-output quick charger. For a bit of futuristic flare, the i MiEV is the first car from Mitsubishi to have light-emitting diode headlamps and taillights. In tandem with the i MiEV launch, Mitsubishi outlined new green-car goals for 2020. Besides wanting EVs to account for 20 percent of its global production by that date, the company wants to halve the average carbon dioxide emissions of its global lineup. In the factory, Mitsubishi aims to cut per-vehicle carbon dioxide emissions by 20 percent from 2005 levels. Fuji Heavy Industries launched lease sales of its own electric vehicle in Japan yesterday. It is a plug-in version of the Subaru Stella minicar. Deliveries of the Stella start next month. Fuji is targeting leases of 170 units by next April. The Stella EV is priced at $49,255 and is eligible for a government subsidy similar to that offered on Mitsubishi's i MiEV. Subaru has no plans to sell the car overseas.